God running through us to the world. 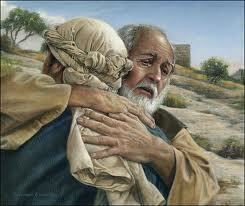 I love the parable of the prodigal son. You remember. The youngest son takes his inheritance early, squanders it in rebellious living, and eventually finds himself in a pig pen, hungry and alone, longing even to eat the pig's food. He decides to return home and request to become a servant. But his father had different plans. As soon as he saw his son on the horizon, he RAN! Did you know that in Middle Eastern culture it was a shame for a man over forty to run? And to run, he would have had to lift his skirt, which was equally humiliating. But the father didn't care: he humiliated himself, hiked up his skirt, and ran to greet his son. When Jesus came to earth as a man, he humbled himself. Of course, when we read the parable of the prodigal son, it is not hard to see ourselves as the rebellious one in the pig trough. And God runs in his humility (the incarnation) to our rescue. Now, take a look at yourself (I'm thinking about myself here) and those around you that form up this church, Christ's body, those God has chosen to take his message of love to the world. Sometimes (OK, most times) we appear to be a ragamuffin band. Why would God humble himself to let us be his representative channels? In effect, he is hiking up his skirt again, running in humility through us to a rebellious world, trapped in pig troughs of their own making. I like that imagery. He is running in humility through you and me. To the lost around us. What a privilege it is (unworthy as we are) to be used of God in this way. Grace to you. Thanks for your prayers.